Working on scaffolding can be dangerous, unless you take the proper precautions. Scaffolds are an important piece of equipment on a construction site. They allow workers to safely work on the exterior of a building efficiently. Any time someone is working off the ground, there is an increased risk for injury. 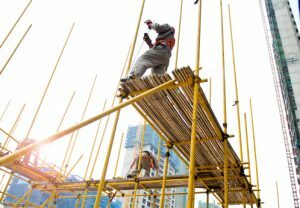 The Occupational Safety and Health Administration (OSHA) has some pretty strict guidelines for scaffolds, but construction workers should know how to stay safe while working on this vital piece of equipment. Just like with any construction site, wearing the proper protection is important to keeping yourself safe. Scaffolds let people work at different heights at the same time, usually right above and below each other. Being aware of the work that is taking place around you and wearing the proper protection, a hardhat, eye, and ear protection, is the first step to avoiding injuries on the job. One of the biggest dangers of working on a scaffold, or in the construction industry overall, is falling. The majority of OSHA’s regulations regarding scaffolding deal with its structural integrity, platform dimensions, and proper fall safety protocols. Workers are to use personal fall arrest systems, which can be comprised of an anchor, connectors, a body belt or harness and may include a lanyard, deceleration device, lifeline, or combination of these. It’s important to make sure your lifeline is attached to a strong anchor point that is not part of the scaffold itself. This entry was posted on Tuesday, June 28th, 2016	at 11:59 am	. Both comments and pings are currently closed.